Crime Is Down And Response Times Are Faster Among Findings Of Annual Boise Police Report – Don't Drone Me! 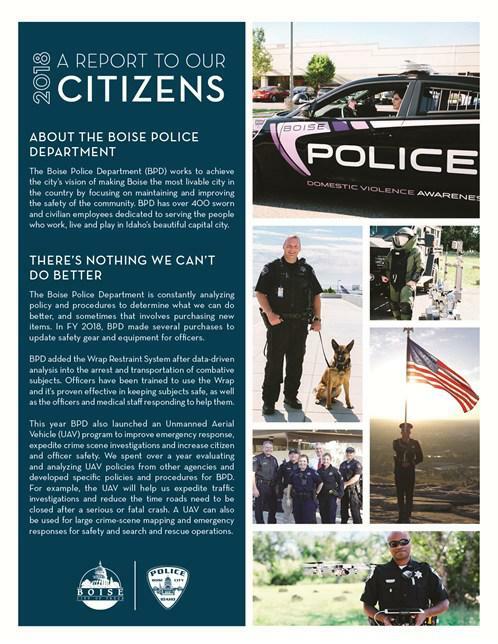 The Boise Police Department is out with a report offering residents of the City of Trees a snapshot of the agency. Calls for service are up, but crime is down and response times have improved. The 2018 Report to Citizens from Boise PD outlines trends like those and details where the department is focusing its efforts. According to the report, the department got over 160,000 calls last year. Violent crimes were down by 8 percent in 2018, and burglary – which is already at a historic low – declined by 15 percent.